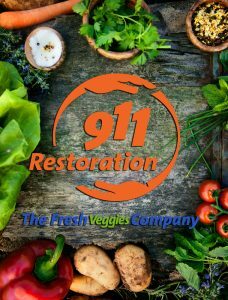 Here at 911 Restoration one of the ways we embody “being the fresh start” is by trying to eat and live healthy. Eating healthy doesn’t only involve eating organic, or consuming a lot of fruits and vegetables. We often forget that food health begins before you even put a bite of food in your mouth. That’s because many foods can contain bacteria, mold, or even salmonella which is why properly washing and storing your food is so essential. This may seem obvious, but make sure that you always wash your hands before handling food, especially if handling meat or poultry. Remember to sanitize sinks, cutting boards and other cooking surfaces such as counters and your dining table. Keep the cooking area clean by removing any mold or mildew from standing water near your kitchen sink. Always wash meat, poultry, fruits, and vegetables thoroughly before cooking or consuming them. Cook food all the way through, particularly raw foods and poultry products, in order to ensure that the items are absolutely safe for human consumption. Cooking food at 158 degrees will kill harmful bacteria like salmonella and e.coli. Even if an item is marked as “pre-washed”, go ahead and wash it again. Also, follow the news for any food recalls. Better safe than sorry! Store food products at proper temperatures to ensure safe consumption and the longest shelf life. The maximum temperature for food stored in your refrigerator is 41 degrees; anything higher will encourage mold growth. Discard any items in your refrigerator or fruit on kitchen counters that has begun to show signs of mold spores. Some common groceries that get moldy quickly are avocados, tomatoes, lemons, and limes. The World Health Organization (WHO) has data stating that nearly 2 million people die yearly from food and waterborne diseases. Knowing this properly preparing and handling food, especially meat, poultry, fruits, and veggies, is essential to your family’s safety. For more information on fungi, mildew and mold removal services, contact our mold specialists at 911 Restoration today or check out the “Mold Section” of our blog.